Reading the Elvis Information Network interview with Vic Colonna, the man behind many of the classic Elvis bootlegs, I remembered the time me and my brother bought our first vinyl bootleg. It was October 20, 1984. Needless to say, my brother and I were thrilled. We watched a show by the band C. C. Riders, (they were very good, I recall the singer doing a great job on "Hurt") participated in an Elvis competition and saw Elvis On Tour for the first time. And we bought us a bootleg titled Unreleased Tracks. The A side included rehearsals from Las Vegas and the B side audience recordings. Somewhere in between was the studio cut "You Don't Know Me," thrown in for good measure, I guess. Listening to it now it takes me back in time. If I close my eyes I can see my brother studying the cover as we enjoy never before heard songs such as "Portrait Of My Love," "Turn Around Look At Me" and "You Can have Her." 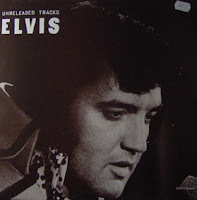 The sound quality leaves a lot to be desired, but hearing Elvis rehearse songs such as "Portrait Of My Love," "Any Day Now" and "True Love Travels On A Gravel Road" is still an interesting experience. 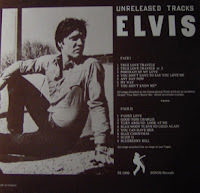 After a quick look in Joe Tunzis book Elvis Sessions III I would guess these tracks are from 1970 and 1972. By the way, some of the audience recordings on this bootleg are playing at a speed which is way to fast. "You Can Have Her" has Elvis sounding like Mickey Mouse! I wouldn't rank Unreleased Tracks as a classic bootleg like for example Behind Closed Doors or Rockin' With Elvis New Years' Eve. But it's historic to me in the sense that it was the first one me and my brother bought all those years ago.